Lauren and Simon chose Le Petit Chateau in Otterburn, Northumberland for their wedding. They were won over by it's quirky decor, beautiful gardens and friendly feel. The weather sadly wasn't on our side and rain poured down the entire day. As we let our creative juices flow, Lauren and Simon were only too happy to play along to make the rain a thing to remember, and it all turned our rather well in the end! How did you meet? What is your story? "We met at school, we were friends from first school but actually got together as a couple at high school." "It was the night before my 30th birthday. We were living with my parents at the time as we were in the middle of moving house. When we got back from the cinema I went upstairs to check on our daughter Fearne and found the ring box and a card in her cot and in the card it said ‘Mammy please will you marry my Daddy?)" Tell us about your venue. Why did you pick it? "We chose Le Petit Chateau because after having lots of friends weddings over the last couple of years we liked that nobody we knew had been married there before. We loved how different and quirky the venue was, it had a lovely feel about the place and the staff were all so friendly. 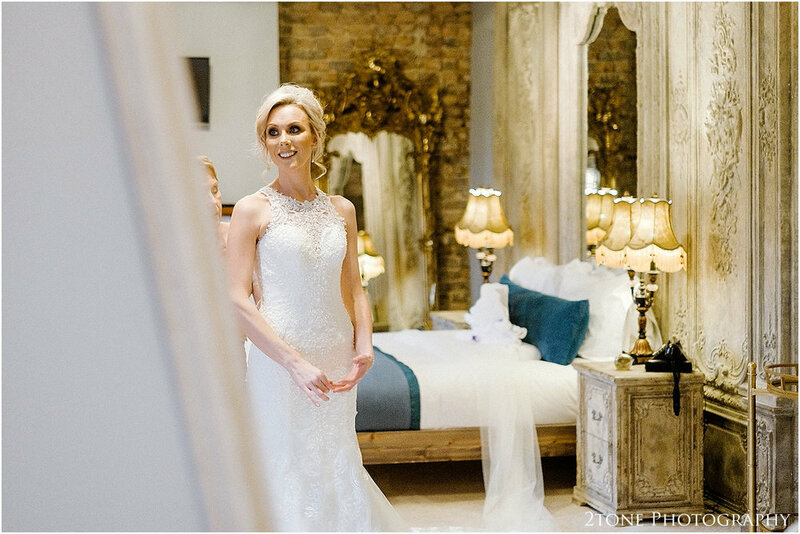 We loved the inside and the outside and also that we had plenty of rooms for people to stay, however it was definitely the ceremony room that really won us over." What was your absolute favourite part of the day? Does your spouse have a different favourite? "I just loved every minute of it!! His favourite part was the morning, the build up when all of the lads turned up and the adrenaline started before they went in for the ceremony." Why was photography important to you and why did you choose 2tone Photography ? "Photography was important because although we will always have the memories, the day really does just go so quick and we wanted some great pictures to be able to look back on over the years and remember. We chose 2tone because we loved the photos they did for my sister and friends wedding and liked how there was Nigel to be with the boys in the morning and Chrissie to be with the girls to get a picture of the whole morning both sides. We also love how relaxed they make everyone feel and the natural pictures they capture." Do you have any advice for brides and grooms who are currently in the planning process? "Just dont stress about the little things. Everything will come together in the end." What is your favorite part of being married now? "Feeling slightly closer as a family now we all have the same surname."